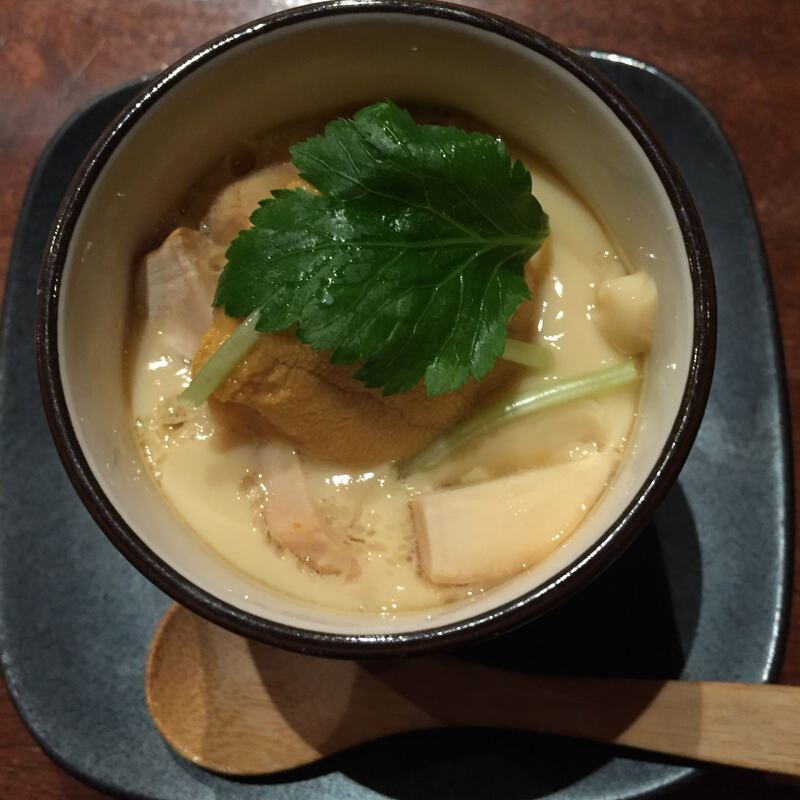 I have tried very, VERY hard to not keep writing about Blue Ribbon Izakaya. 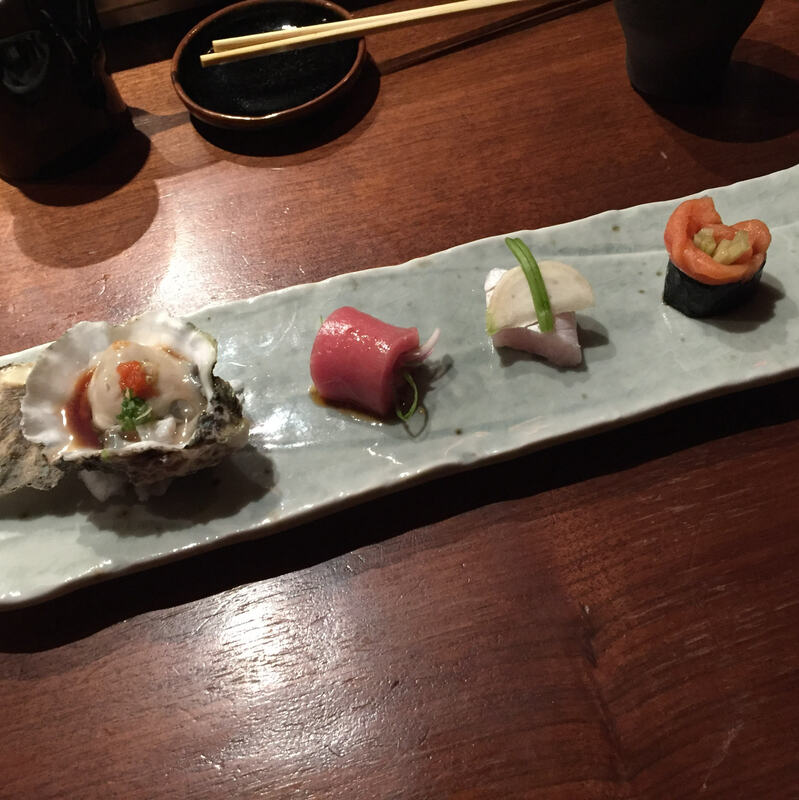 But I was completely blown away during this latest visit with Chef Tsuyoshi Takahashi. I won’t go on and on about our staple dishes, but there are a number of new servings that really commands our attention. Same as my September posting, I’ll keep this post as short as possible, focusing only on new delicious servings! 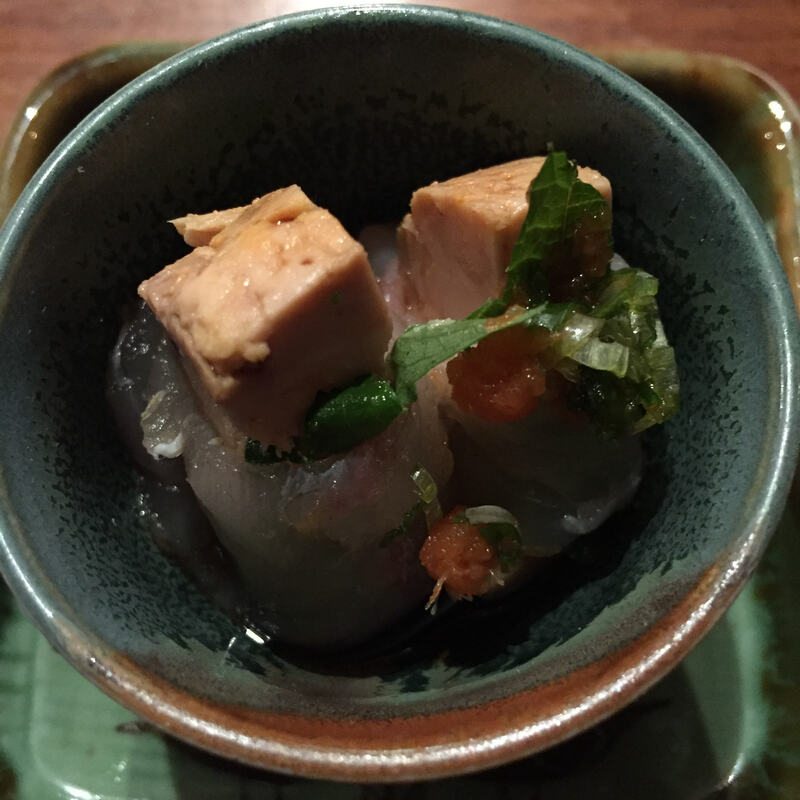 ANKIMO (Monkfish liver) – Two pieces, one wrapped in SHISO and HIRAME (flounder) and the other in SHISO and ENGAWA (flounder fin), both served in Ponzu sauce, topped with MOMIJI OROSHI (Grated Daikon Radish marinated with red chili peppers) and thinly sliced scallions. Season just started for ANKIMO, and I am THRILLED that it has. These bite-fulls pack such an unexpected bright AND rich flavor, yes, it is possible to be both. The ANKIMO, as expected was very rich, very decadent, while the SHISO, HIRAME/ENGAWA, Ponzu brought such a lovely brightness. So outrageously delicious! 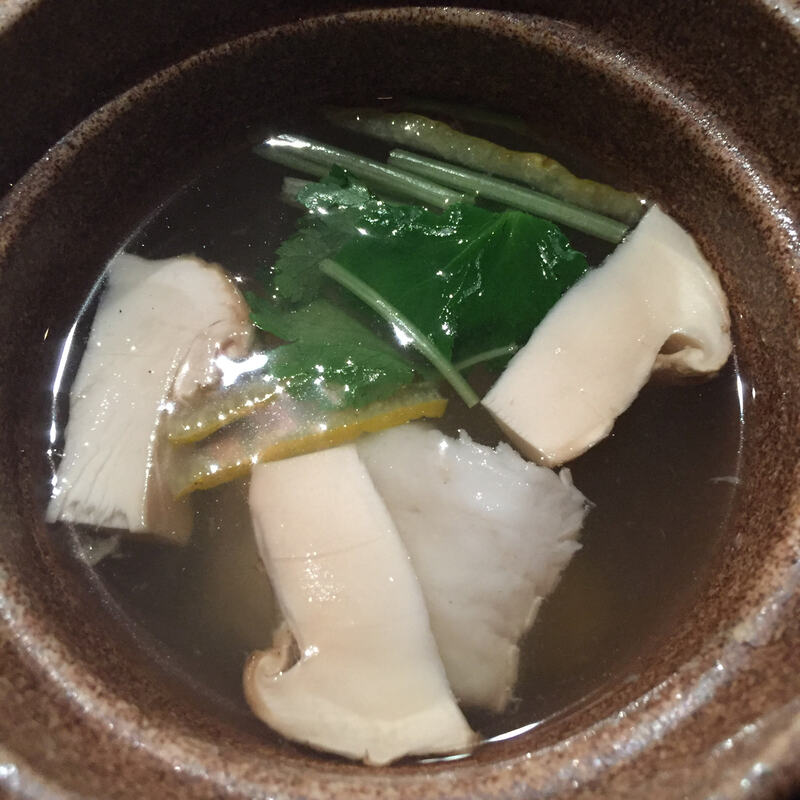 MISO featuring a seasonal mushroom, and dressed with shiso and chives. It was good, but I just don’t get so excited over soup. 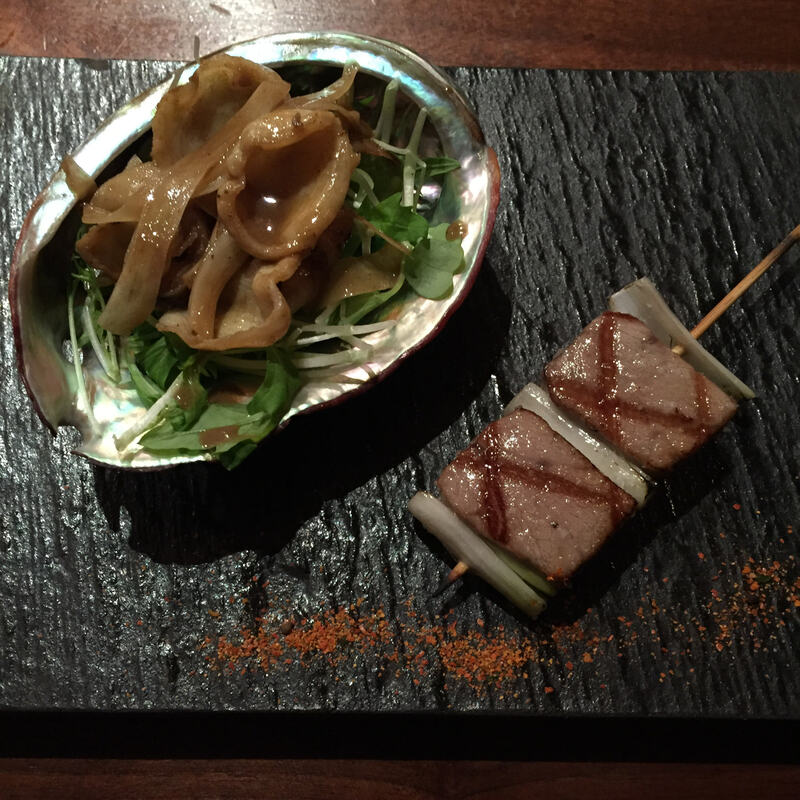 AWABI (Abalone) and OTORO (Super Fatty Tuna) – AWABI is boyfriend’s absolute favorite thing in the world, well, maybe tied with Santa Barbara UNI. Boyfriend loved this sautéed version, and I thought it was very good, but prefer either raw AWABI like they serve at Karuma, OR the Chinese method of braising it. I don’t love simmered OTORO, but this version was very good. 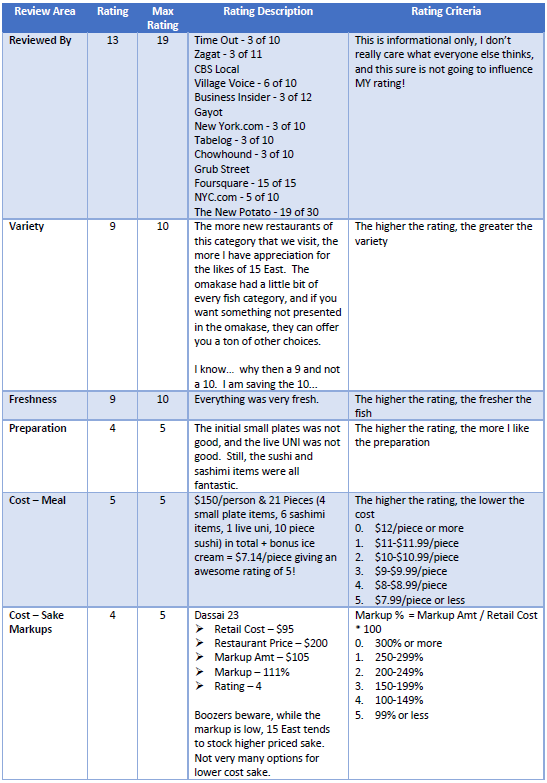 ISE EBI 3 ways – Like I said, I won’t go on and on about the staples, so take a look at my May, August, or September Postings. 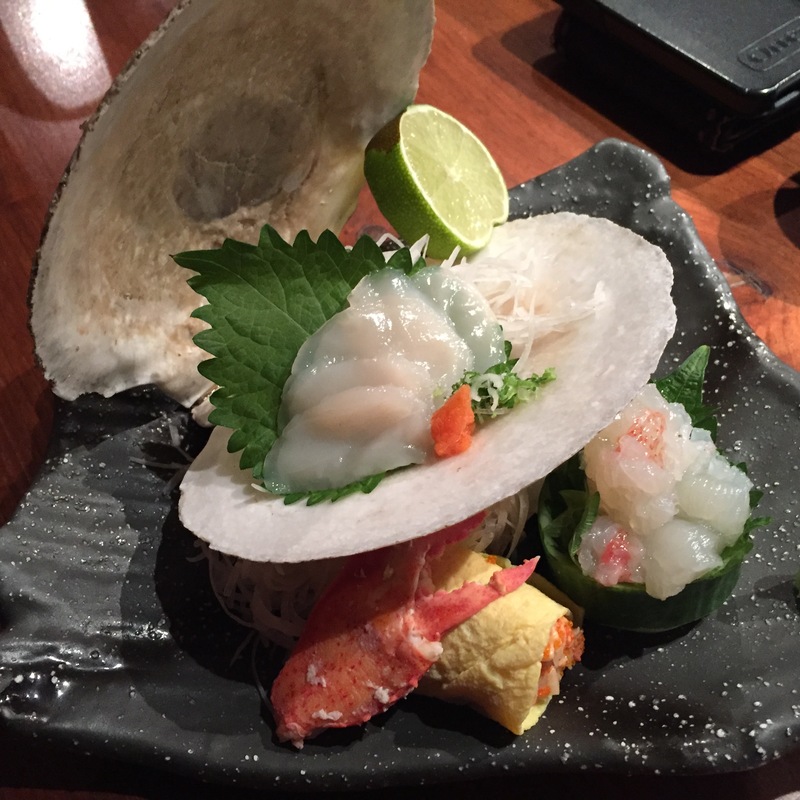 Live HOTATE (Scallop) – take a look at my September post! Seafood CHAWAN MUSHI topped with Santa Barbara UNI – I typically poo poo servings of CHAWAN MUSHI (steamed egg custard) as part of my omakase, except when it is made with yummy filling of KANI (crab) and mushroom, and topped with UNI. I managed to eat my entire serving. Marvelous! 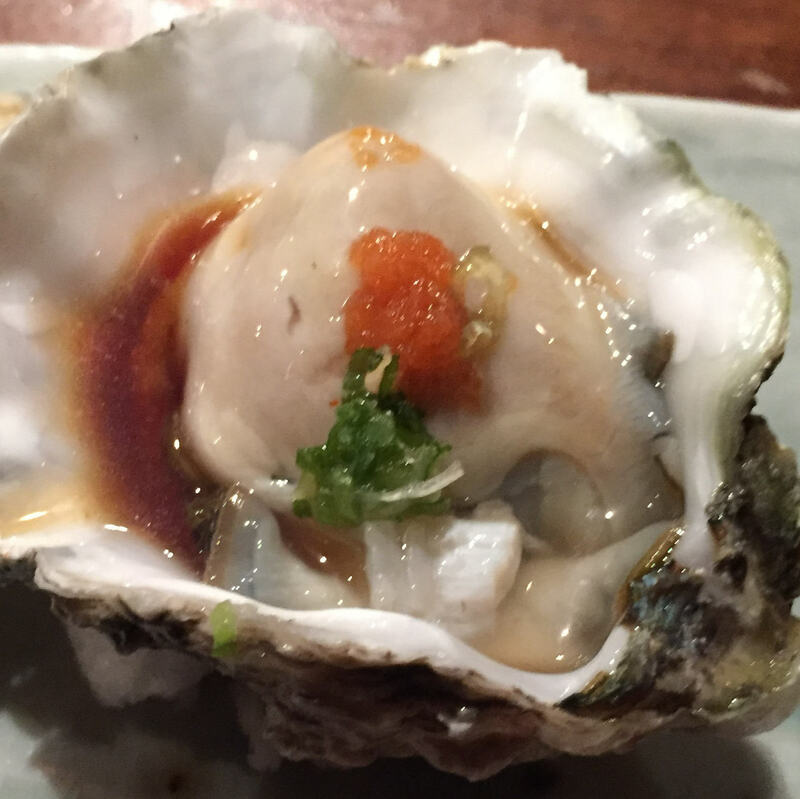 West coast oyster served with MOMIJI OROSHI and thinly sliced scallions – lovely! 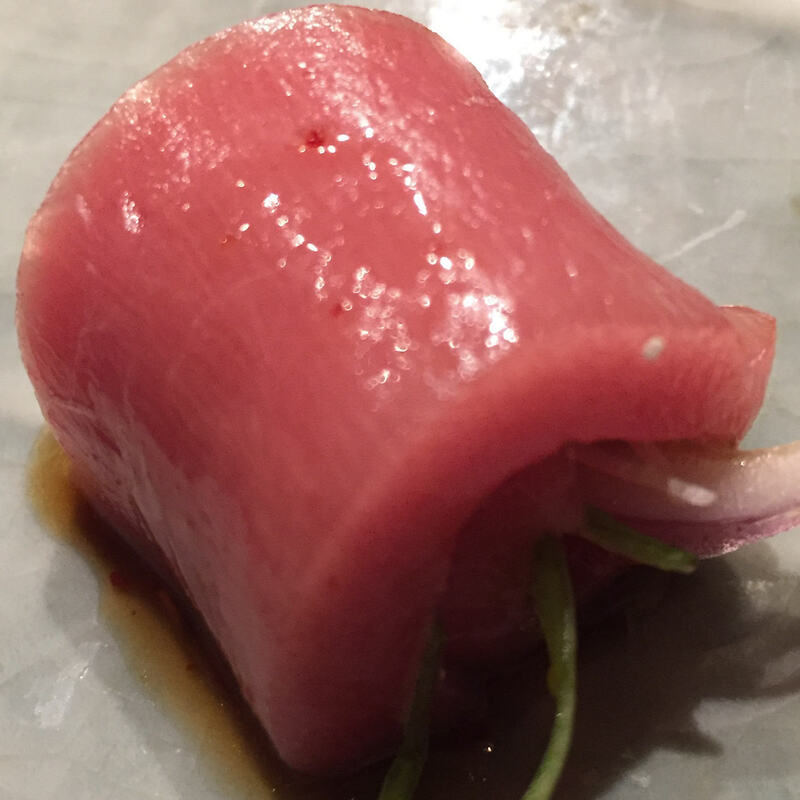 CHUTORO (Medium Fatty Tuna) – a few sprigs of arugula and finely sliced shallot wrapped in CHUTORO. Winning! 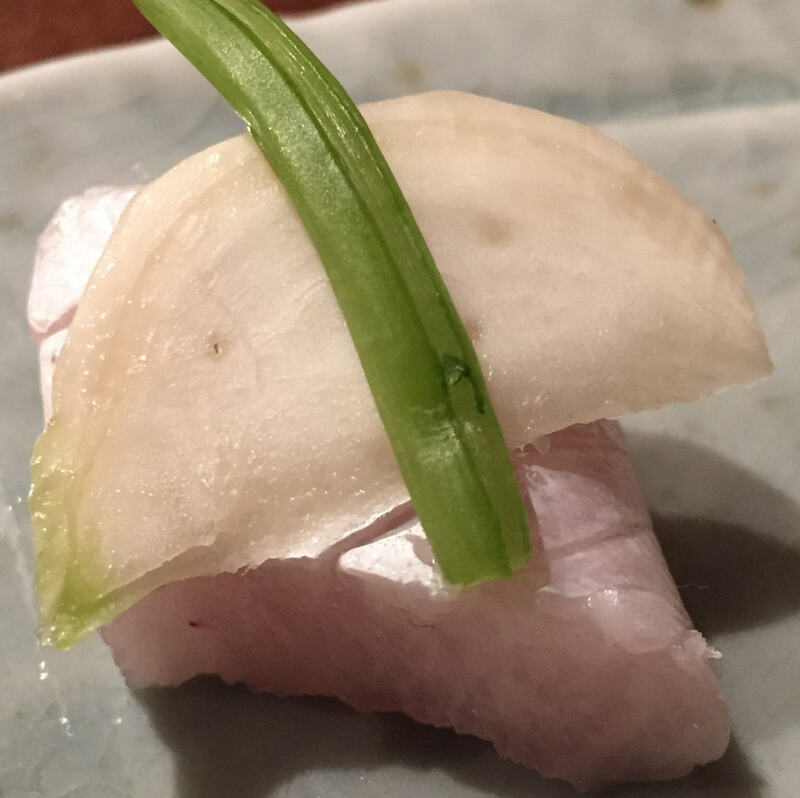 HAMACHI-SUNAZURI (Yellowtail Belly) – topped with a thinly sliced pickled HARUKEI turnip and some sort of a green. 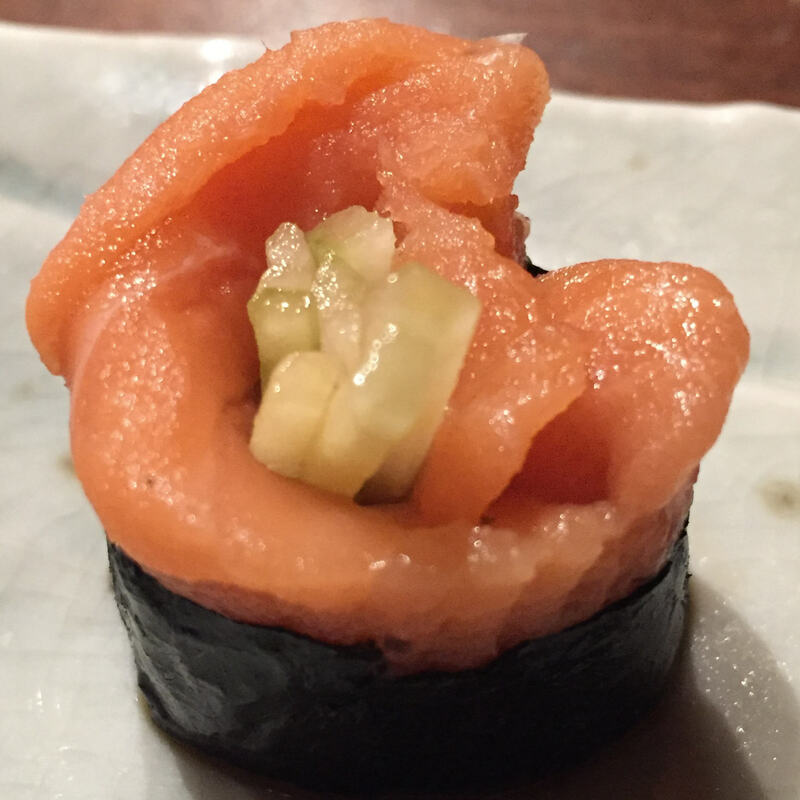 SAKURA-MASU (Cherry Salmon) with cucumber slices, wrapped in NORI. I’m usually not a salmon fan, but this was really tasty! NODOGURO (Black Throat) – Towards the end of its season, but still oh so lovely. 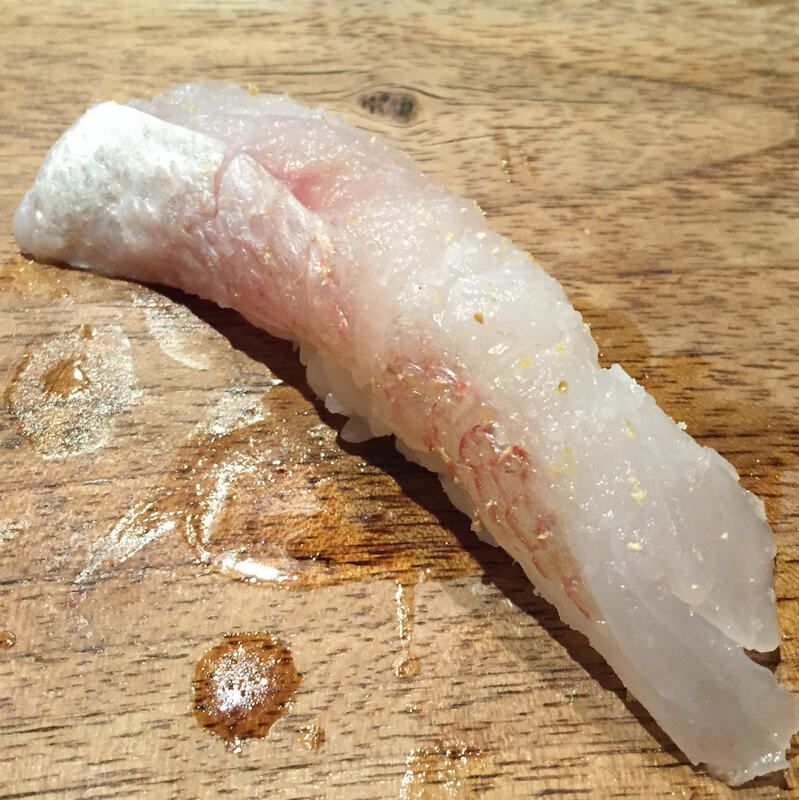 This beautiful piece of NODOGURO was served the best way possible, with some shaved YUZU and sea salt. 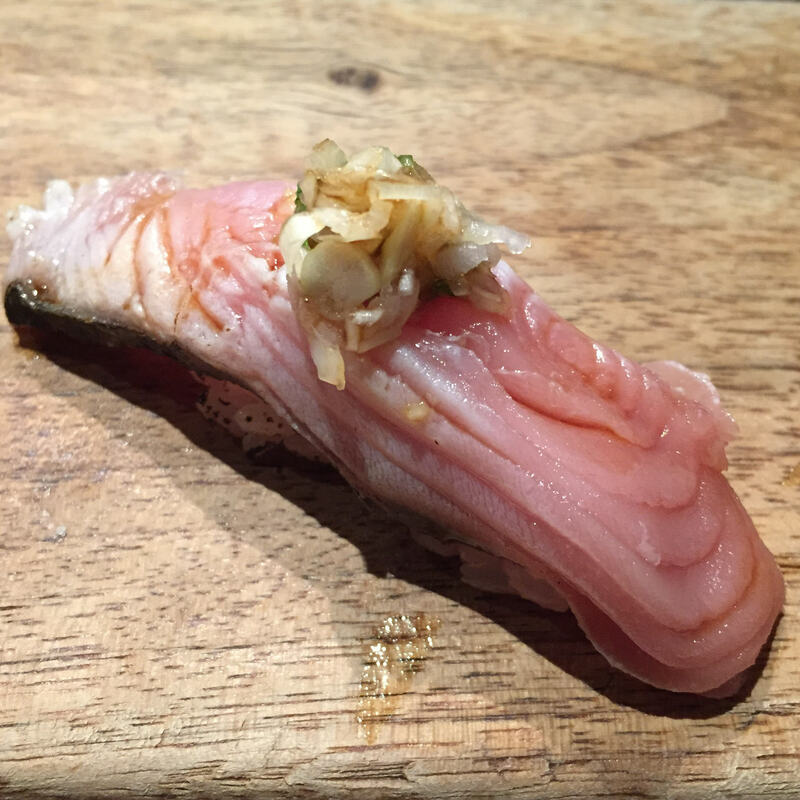 KAMASU (Barracuda) – Prime KAMASU season, I’m getting served this lovely lighter of the silvers left and right. First ABURIed (torched), then topped with finely chopped shallot, scallion and a few drizzle of soy. Very good. 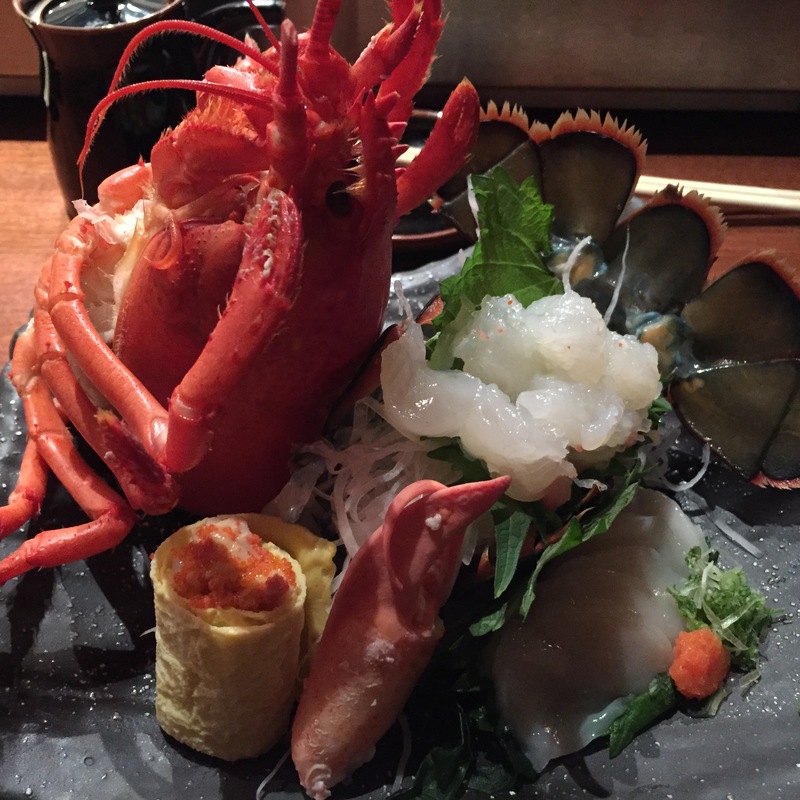 HAGASHI TORO – I LOVE that chef always serves us HAGASHI TORO. It’s probably my favorite of the toros, but not often served as it’s so labor intensive. It’s a super fatty toro, found at the top of the Tuna tail, sliced very carefully between tendons and sinews. It’s my favorite because it never has any chew, or that funky tinge the CHUTOROs and OTOROs sometimes have. 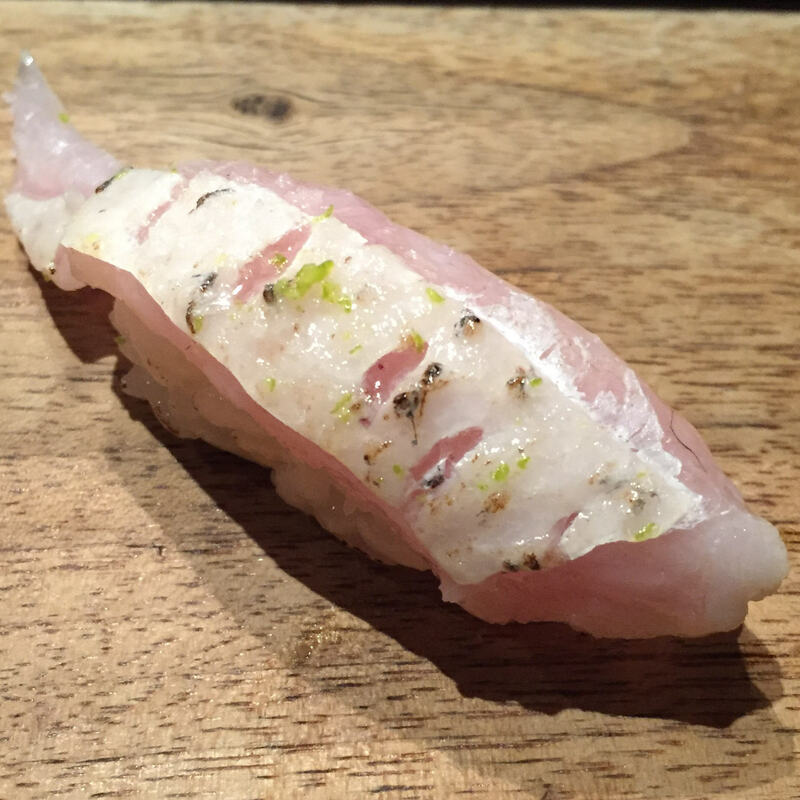 Chef dressed this beautiful cut with shaved YUZU PEPPER. Just delicious. 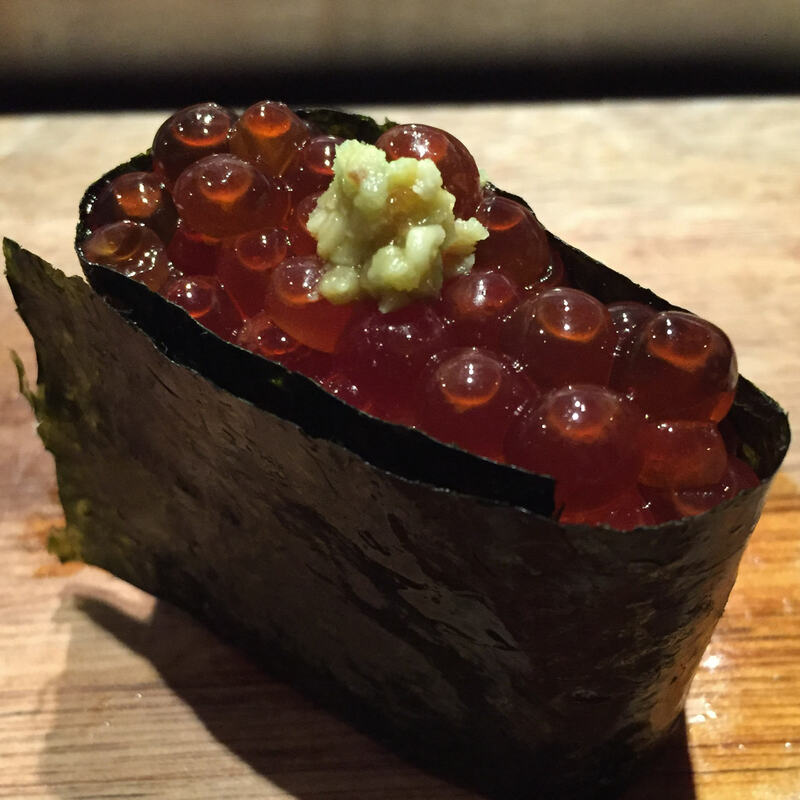 IKURA (Salmon Roe) – luscious big pearls of crunchy well seasoned IKURA topped with a tiny dollop of wasabi. Winning! 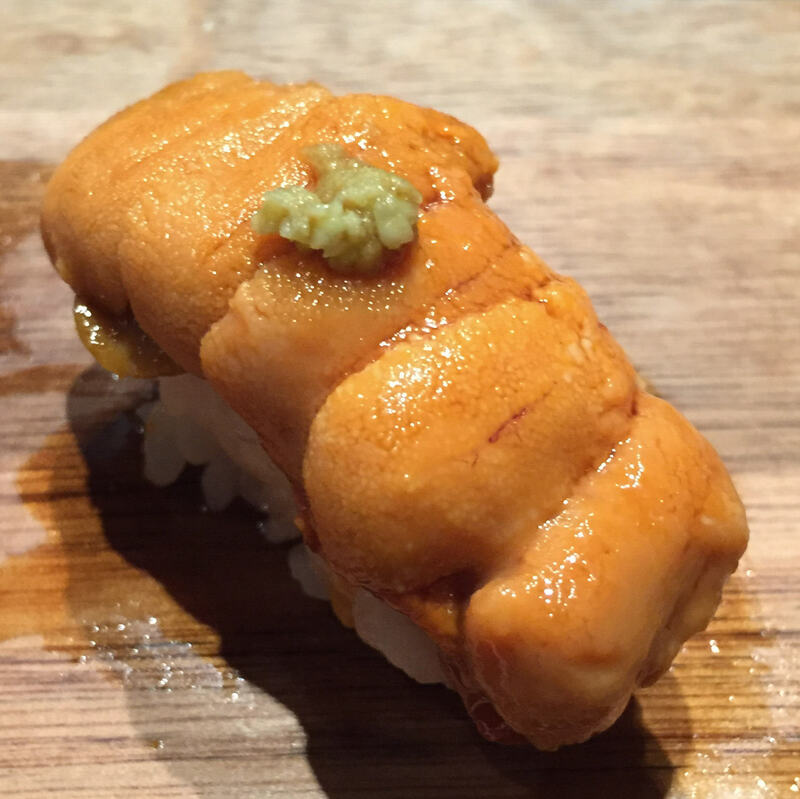 HOKKAIDO UNI – How marvelous does this look? SCRUMPTIOUS! 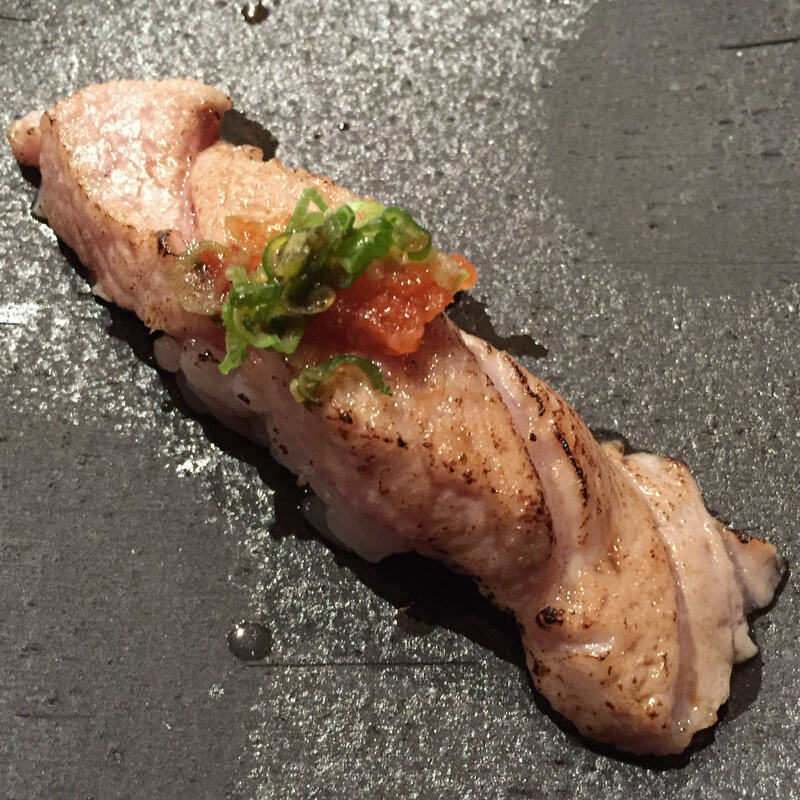 KINMEDAI (Golden Eye Snapper) – One of my favorite white fishes, served with the skin slightly ABURIed (torched) and topped with some freshly squeezed yuzu (Japanese citrus) and some sea salt. It could have used more ABURI-ing, but this was super duper delicious! 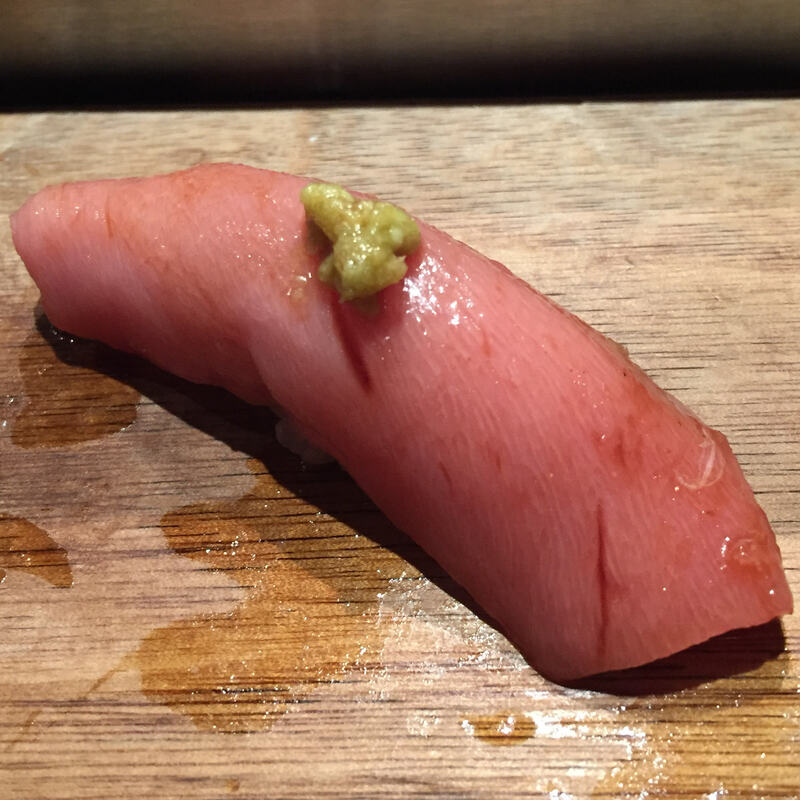 OTORO (Super Fatty Tuna) – I often feel that OTORO is just so fatty that it leaves a gross grime of oil in your mouth. And I don’t really understand the magic of ABURIing (torching), but I feel like it just makes everything better! Well, not everything, only skins of certain whites, all TOROs, HOTATEs (scallops), Waygus, and well, that’s pretty much it. Hahaha! Ok fine, my mind drifts and I lose concentration. This was fantabulous! MADAI (True Seabream) – Another one of my favorite whitefishes. I wish the skin here was ABURIed too, but the way chef served it, tiny squeeze of YUZU citrus, topped with YUZU salt, it was still delicious! I don’t think there’s enough YUZU in the world. I love it!!! By the way, boyfriend waved his white flag already. He actually stuck it out when the UNI came, but found room. What a wimp! 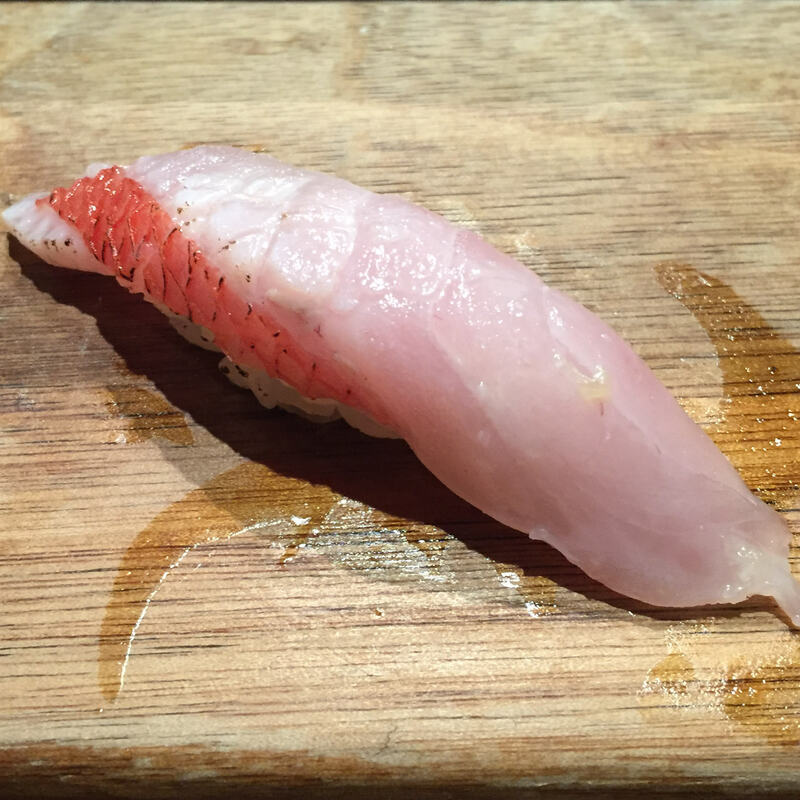 KINTOKIDAI (Red Big Eye Snapper) – We are rounding out with ALL my favorite whites! 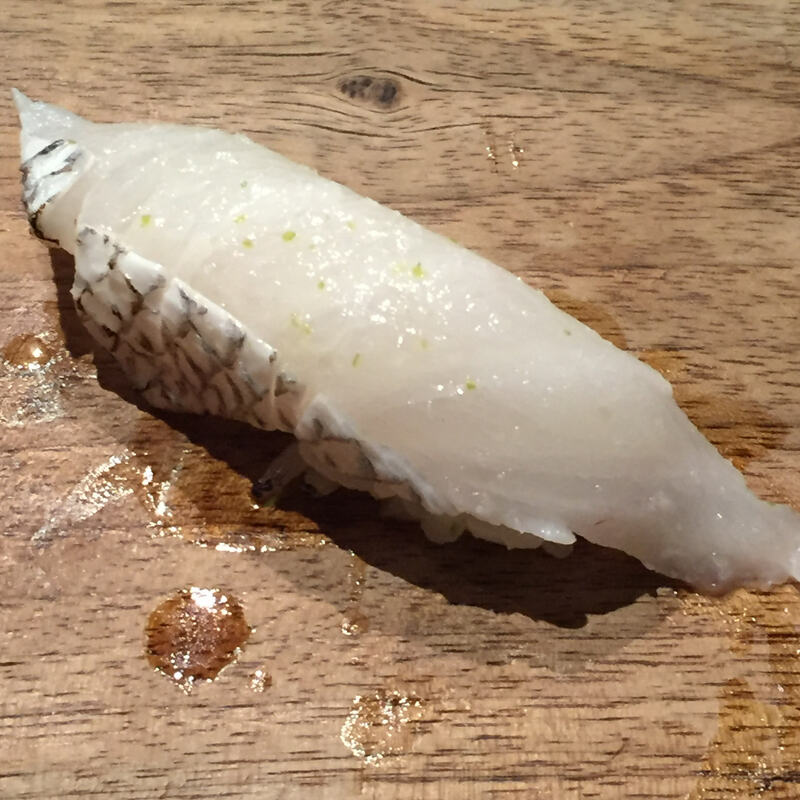 Served similar to the MADAI, tiny squeeze of YUZU citrus, and a splash of sea salt, this one was PERFECT. KINTOKIDAIs do not require any ABURIing, it was perfect the way it was. 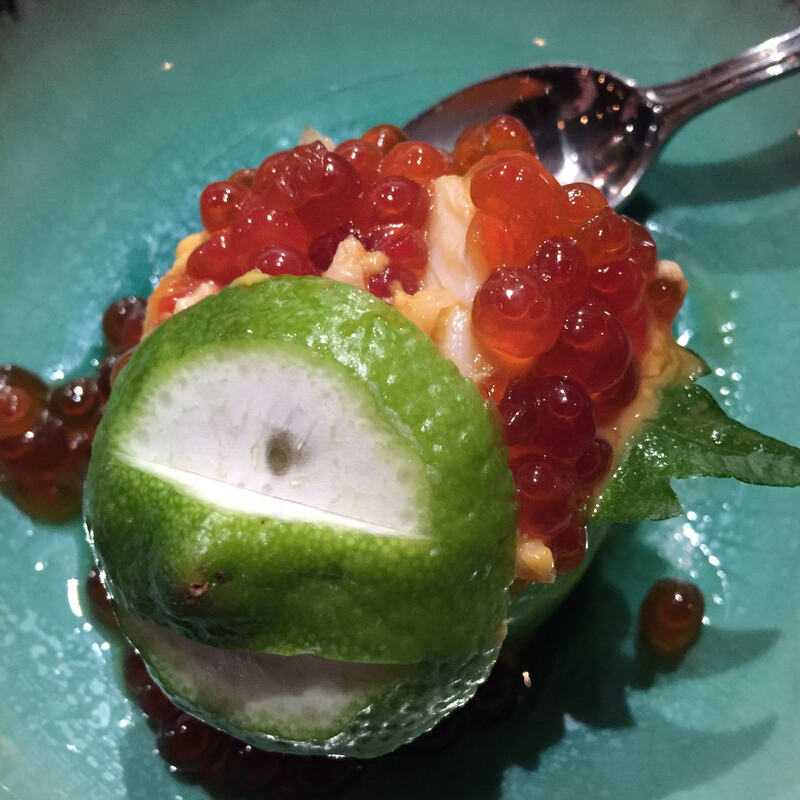 ZUWAI-GANI/UNI/IKURA “bowl” – To round out my omakase, chef presented me this beautiful “bowl” of ZUWAI-GANI (snow crab) mixed with the lovely HOKKAIDO UNI, served inside the hollowed YUZU shell, lined with SHISO, and topped with the beautiful kernels of IKURA. Marvelous combination, and perfect finale to my omakase! 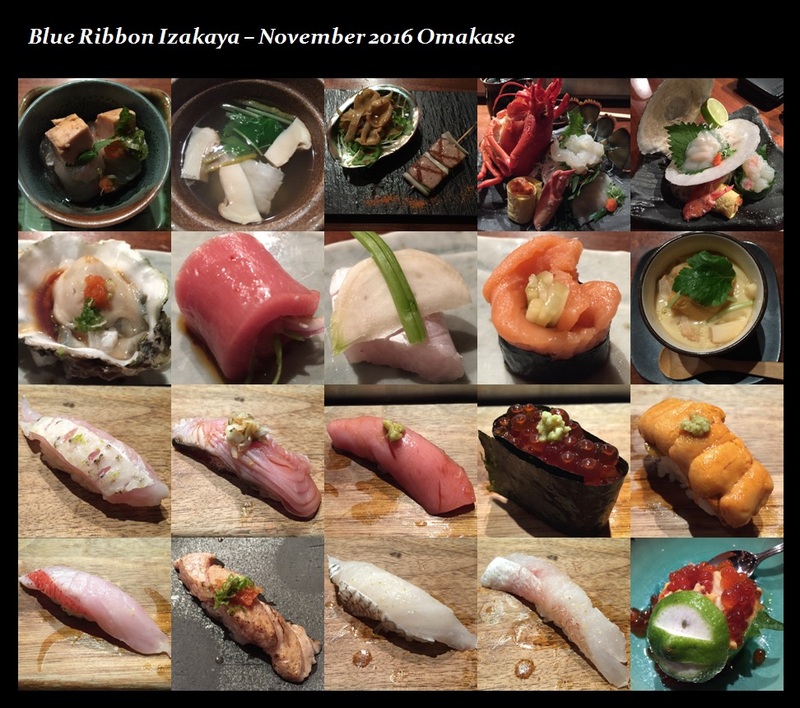 Every single serving of Chef Takahashi’s omakase was out of this world, amaze balls. He is absolutely magnificent! 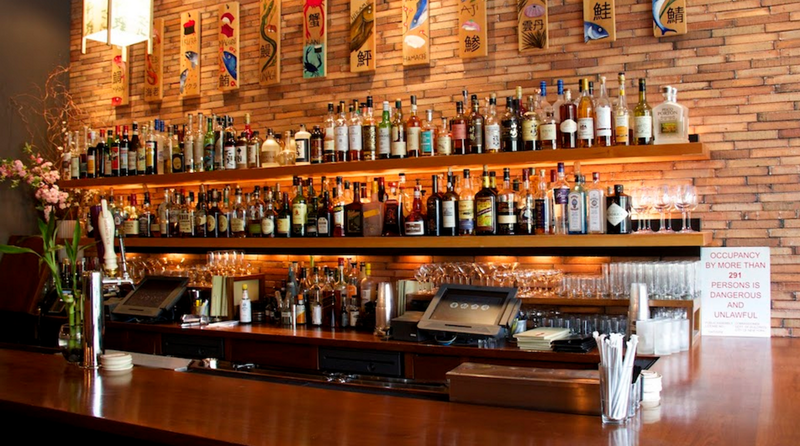 We try all these “top rated” restaurants, and no one compares! Again, another overall rating of 34 out of 35!